Built 1938 by Fred. M. A. Brons for the city of Arnhem, on the site of a previous theatre (built 1865, destroyed by a fire in 1934). Opened 1938 with Schiller's play "Don Karlos". Damaged in World War II, subsequently repaired. Re-opened 1951. 1962 renovations. 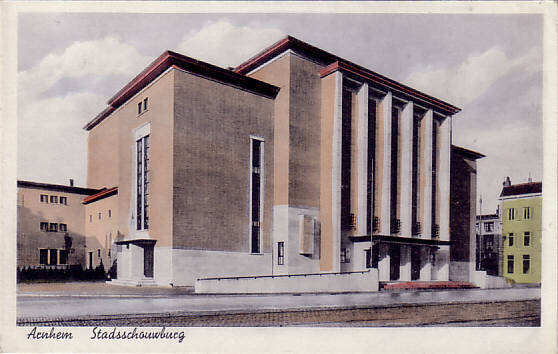 1978 addition of the smaller hall "Kleine Zaal". "Groote Zaal" (Large Hall): 764 seats, "Kleine Zaal" (Small Hall): 250 seats. 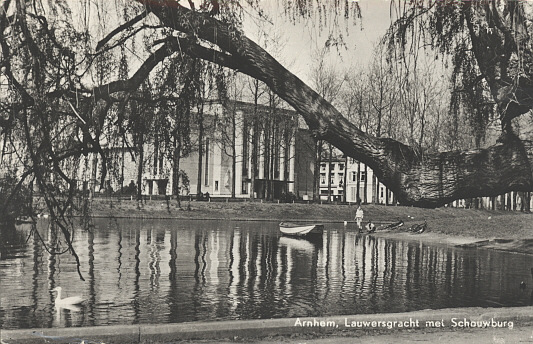 Type: "Graphit koloriert - mit Rand"
Front Text: "Arnhem, Lauwersgracht met Schouwburg"